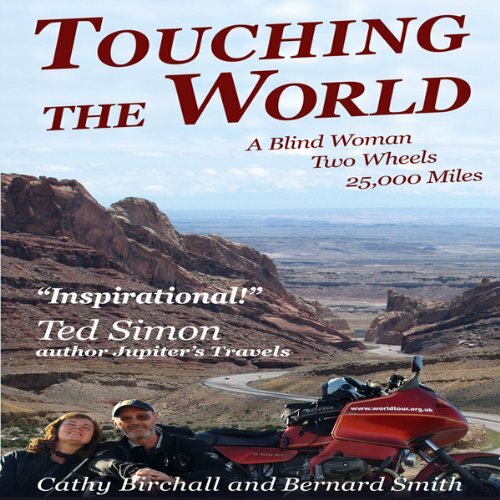 Touching the World is the extraordinary story of Cathy Birchall, a blind woman, who set off with her companion Bernard Smith, to become the first blind person ever to circle the world on a motorbike, an 18 year old BMW R100. What transpired has become an inspirational worldwide story that challenges people to question their own self-imposed boundaries. From desolate and dangerous mountain roads, difficult border crossings and numerous mechanical breakdowns, to climbing Wayna Picchu (first ever blind woman to do so) and riding an elephant mounted from the front (via its trunk!) - not to mention a poignant visit to the Centre for Blind Women in Delhi where they talked to women abandoned by their husbands, and an (inadvertent) overnight stay in a Kosovan brothel - this book has it all, travel, adventure, triumph over adversity, and through it comes a real sense of just what it means to be blind. Their heart-warming writing reflects a vivid account of the world, often hilarious and always positive.